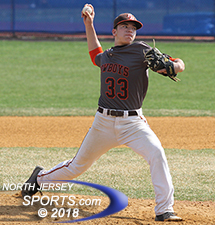 Junior Brandon Siegenthaler needed 100 pitches even to go the distance on a 7-hitter as Pascak Hills improved to 6-1 in the season with a 6-1 win at Demarest. OLD TAPPAN – Building a program in an up-and-coming sport is not easy. On the girls lacrosse landscape in North Jersey you have the bell-cow in Ridgewood, a legitimate state power that competes for Tournament of Champions titles seemingly every season. There are the established programs like Ramapo, Northern Highlands, IHA and others that are perennial state tournament teams and below that are a bunch of programs trying to get established by playing younger players, building feeder systems and hoping that the efforts eventually take root on the varsity level. Old Tappan is one of those programs trying to gain a foothold. With just two seniors on the roster and a first-year head coach, the Golden Knights are a work in progress…but there has been progress. Old Tappan scored the game’s first goal in the third minute and never trailed over the 50 minutes of play in an 11-6 victory over Passaic Tech on Wednesday, a win that pulled the Knights back close to .500 at 3-4 on the season with a favorable schedule ahead. Old Tappan was coming off an excruciating loss to Westwood in which it gave up the tying goal in the final minute of the second half before losing in overtime. While the loss hurt, it was another example of how the Knights are gaining ground in terms of terms of their play on the field. Yes, it could have been a win which would have given them a three-game winning streak, but instead it was another example of how far the Knights have come. Walker’s goal with 12:20 left in the first half and Rochford’s goal 35 seconds later gave Old Tappan a 5-0 lead against Passaic Tech before the Bulldogs got on the board. Emily Vander May swooped in from the right of Old Tappan keeper Cassandra McGowan and scored with just over 10 minutes to go in the opening half. The Knights held a 7-2 lead at the half and never let Passaic Tech get closer than four goals the rest of the way. Vander May (3 goals), Alexa Stoepler (2 goals) and Emily Duval combined to score all six of the goals for Passaic Tech, which fell to 2-5 on the season. Samantha Derrico and Rochford scored a team-high three goals for each for Old Tappan, Walker tallied twice and Helfman, Avery Linder and Emily Derrico each scored one goal for the Knights. Fishbein and Emily Gullestad each added assists. With games against Bergen Tech and Saddle Brook next up the schedule, Old Tappan can make a push to get back over .500 for the year and keep the momentum building for the program.